Russia's Foreign Minister Sergey Lavrov met his Turkish counterpart Tuesday for talks on the Georgian crisis and a trade dispute. Turkey has threatened to retaliate against new Russian import controls that are seen as an attempt to punish Turkey for allowing U.S. warships carrying aid to Georgia to pass through the Turkish straits, that connect the Mediterranean to the Black Sea. The extra import checks for Turkish goods have resulted in hundreds of Turkish trucks being held up at Russian border posts. Turkey's trade minister has said Turkey would impose more stringent trade restrictions on Russian goods, but Cemil Cicek, the deputy prime minister, told reporters Monday that Turkey favored resolving the issue through dialogue. Russia is Turkey's top trading partner and supplier of two-thirds of its natural gas. 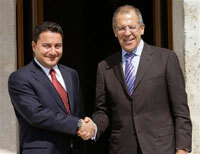 Lavrov and Turkey's Foreign Minister Ali Babacan were also to discuss a Turkish plan for a regional group to stabilize the Caucasus region following the war between Russia and Georgia. Turkey tried to mediate a peaceful solution to the Russia-Georgia conflict, but the proposal did not receive immediate backing from Georgia. Georgian Foreign Minister Eka Tkeshelashvili said last week Georgia would consider joining such a group only after Russian forces leave her country. The Turkish-proposed group would include Turkey and four nearby Caucasus nations: Russia, Georgia, Azerbaijan and Armenia. Hours before Lavrov's arrival in Istanbul, another U.S. naval ship passed through the Turkish straits to reach the Black Sea, the private Dogan news agency reported. There was no information on its destination. Last month, two U.S. ships laden with humanitarian aid for Georgia passed through the Turkish straits. One of them, the guided-missile destroyer USS McFaul, sailed back through the straits toward the Mediterranean late Monday, the Anatolia news agency reported. On Monday, Russia suggested that U.S. ships that took humanitarian aid to Georgia's Black Sea coast could also have delivered weapons. Turkey, a NATO member and close US ally, has helped train and equip Georgia's military, which lost a brief war with Russia last month over the separatist region of South Ossetia.